This listing features the Cigar band ring, whose design I fell in love at first sight! It is inspired by Roman and Medieval rings. The original design is from a well known beadwork artist, Heather Kingsley-Heath. 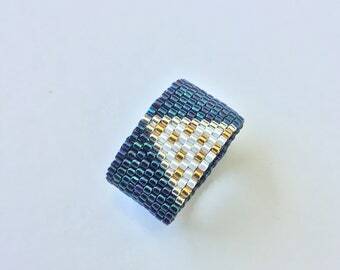 This statement ring is the most comfortable beaded ring you will ever wear. Very lightweight, you can hardly feel it on. Bead-woven rings are also great for anyone with metal sensitivities, as they are made only with glass beads. 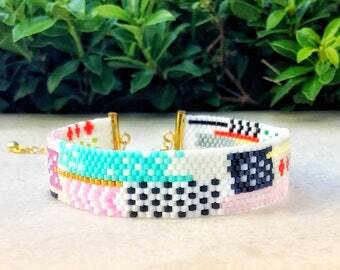 It has been crafted by me with love, care and inspiration, using premium quality Japanese glass seed beads. Dainty texture is created with different size beads, with a gentle gleam of faceted crystals in matching hues, at the heart of the design. Each tiny seed bead has been picked and woven by hand one by one, using a combination of two off-loom techniques, the peyote and Heather's albion stitch and a highly durable thread for weaving. The ring comes in two colors. One in glossy and matte black color and the other in blue lapis hues. You can pick your favorite from the list above or message me if you prefer a different color. This ring is approximately 3.9 cm (1.5 inch) long, its band is 0.6 cm (0.2 inch) wide. It is a 8 US size (57-58 EU size). If you need a different size, you can choose it from the list above, or message me. If you don't know your size, you can follow the instructions below. For converting to other international sizes corresponding to US, use an International Ring Size Chart, like the ones in the last photos. You can wear the Cigar band ring all day long, match it with almost any outfit and let others do all the compliments!